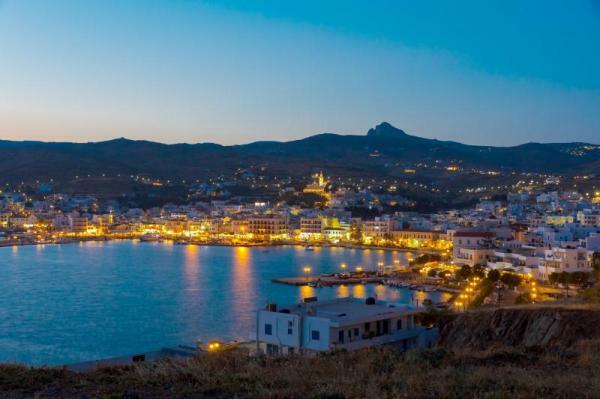 Tinos is the fourth largest island in the Cyclades. Just sixty nautical miles off the coast of Attica and with regular daily services from the ports of Piraeus, Rafina and Lavrio and the nearby islands (Andros, Mykonos, Syros, Paros) is one of the most popular holiday destinations and closer to Cyclades. There are many other organized beaches reached by car or bus; Ag. Ioannis, Kionia, Kolimbithra, Panormos, , Ysternia, Ag. Romanos, Ag. Thalassa, Pachia Ammos etc..
White houses with blue doors and windows, whitewashed cobbled streets twisting under galleries and “volta”, traditional cafés, grocery stores and little taverns, beautiful churches at the village central square, “xynaria” (natural sources) with running water, gardens full of flowers and elaborate stone houses with marble decorations are but a few of the things the visitor will recollect after leaving Tinos.